We flew on China Airlines from LAX direct to Taipei/Taoyuan with the flight to Taipei clocking in at 14 and a half hours and the return trip at 10 and a half. 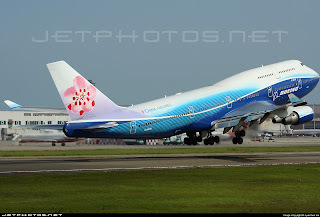 China Airlines is the flag carrier of the Republic of China (Taiwan - China is the Peoples Republic) and flies 747s on their long haul flights across the Pacific. Unfortunately the seating pitch on China Airlines aircraft is better suited to someone 5'6" tall. My femurs are too long! On the flight over my kneecaps were jammed into the back of the armrests of the seat in front of me. When I'd recline the seat, the lower cushion would actually go towards the seat in front of me, further limiting space. Thankfully the seat next to me was empty so I was able to kick a leg to the left and steal the space under the adjacent seat. Still, 14.5 hours of sitting twisted were not super comfortable. To pass the time I had a number of tools - magazines, iPod, laptop and Tylenol PM. Since we boarded at 12:30 in the afternoon, I was in no mood to even try to sleep so I read for a while. Later I fired up the laptop and watched 3.5 episodes (until I killed the battery) of Top Gear's 10th season that I had downloaded from iTunes. After a crummy dinner of bad pasta alfredo and soggy peas, I tossed back a Tylenol PM to get a few hours of sleep in. Since we would be landing around 10 PM, I didn't want to stay knocked out for the entire duration of the flight and not be able to sleep upon arriving at our hotel. So I woke up with about 4 hours of flight left and got back to reading/iPodding. Oh, and iPod solitaire was played a lot. Our bags arrived okay and customs was a breeze. One coworker has had fun with the Taiwan customs over the years, listing his occupation as such things like "custodian" and "male dancer" and listing his lodging as "bus station". I don't think they really care. The hotel had a driver waiting for us at the airport. We grabbed our bags and took our seats in a late model Mercedes S430 for the ~90 min trip to Taichung. That Benz was far more comfortable than the 747. Josh and I did our best to stay awake and take in the Taiwan nighttime scenery. Arrival at the hotel was at 11:30 or so. After 8 hours of sleep in a comfortable bed in a frigid room, I was ready for the new day. The flight back was a bit more pleasant. With strong tailwinds, the trip home shaves 4 hours in the air off. Plus I was seated 6 rows forward and the seat pitch seemed to give me about one more inch of legroom. And again, the flight wasn't full - I had an empty seat next to me. Some lucky travelers were taking over entire center rows of 5 seats and laying across. Poor-man's first class. We departed Taipei at 4:40 PM on Friday and traveled back in time, arriving in LA at noon on Friday. It's fun crossing the international date line. So glad you've finally made it over to "the Rock". Now you know some of the fun I've had over there in the last 18 years. And it's only gotten a LOT better than it used to be. Believe it or not, there is a lot less Scooter Poetry than there used to be. Maybe a sign of the increasing sophistication of the Taiwanese?